Please visit the Renaissance violbows website ! 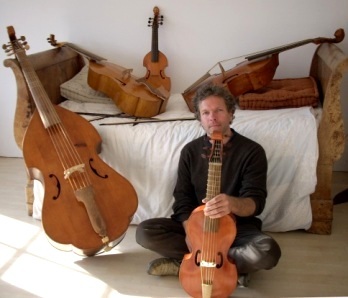 Renaissance alto, renaissance bass and a treble viol (Barak Norman model) made by Pierre Thouvenot, and a Violone in G (home made). 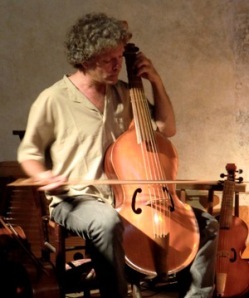 I was already a professional cellist when I started to play the Viola da gamba in 1989, taking lessons with Philippe Pierlot and later doing summerclasses with Jordi Savall in Spain. From 1995 till 2015 I was teaching the viol at the Conservatory/Music High school in Toulouse, directing also the Consortoulouse viol consort. You can find the scores I made for classes and consort on the Partitions page. I have done a lot of chambermusic and a lot of continuo with singers. In 1997 I discovered an anonimous manuscript in the library of Foix, close to where I lived in the Pyrenees. I brought out the facsimile edition and a CD with theorbo player René Vayssières. Since years I played the solos in the St Matheupassion and St Johns passion in Holland. But I decided to stop, this year 2017 is the last one.